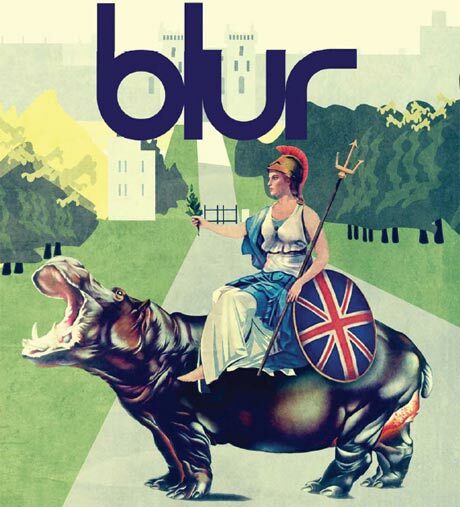 In the UK, Blur have already delivered the band's Parklive, their recent concert set chronicling their performance at Hyde Park as part of the closing ceremonies of the London 2012 Olympic Summer Games. Now, though, the five-disc CD/DVD package is getting a wide North American release December 4 through EMI. As previously reported, the deluxe package will feature two CDs covering the entire Hyde Park performance, as well as a DVD companion. The visual component was directed by Matthew Amos, and the shoot utilized 12 separate cameras to catch the band in action. You can get a taste of what to expect via a new trailer, which gathers live snippets from classic tracks like "Parklife" up to the recent "Under the Westway." The set comes with two other CDs. We already knew that one is titled Blur - Live At The 100 Club and features a full performance at the London club recorded last summer. The remaining disc contains a smattering of live tracks, including versions of "Under the Westway" and "The Puritan" performed from a London rooftop, recordings from the band's Wolverhampton warm-up show, and songs from their BBC Radio Maida Vale sessions. Additionally, the whole thing comes packaged in a 60-page hardback book featuring exclusive pics from the gig at Hyde Park and the 100 Club. If you were thinking of a Christmas gift for the special Britpop devotee in your life, you may have just hit the jackpot. You can see the entire tracklist over here and check out a trailer below.